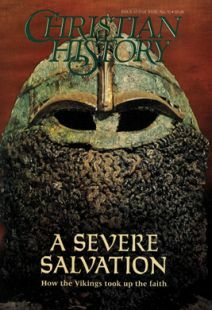 Though the Vikings have been infamous for their attacks on Christian churches and monasteries—inspiring throughout Europe the prayer, “From the fury of the Northmen, O Lord, protect us"—those very raids began a centuries-long process of Christian conversion. The Vikings raided because they had not. And they reasoned they had not (or at least not as much as their targets) because their gods were not as powerful. Envy, ironically, played an invaluable role in introducing Christianity. Furthering the irony, the Viking leaders, having accepted Christianity overseas, sometimes returned to their homelands to conquer for the Prince of Peace—and for themselves. It was a time when “personally accepting Jesus into your heart” was a nonexistent concept; regions felt obliged to convert together, with their leaders, or not at all. Piracy and human sacrifice made sense, and the person who got to choose which god to worship was often the person last left standing. Scholars debate whether people thought the world was going to end at the close of the first millennium. But it is clear that for Viking Scandinavia, it actually happened. Its pantheon died, its way of life was replaced, and it found itself a part of something—Christendom—it had hardly considered. In short, their world ended, and a new Christian one rose in its place. This is how that happened.